Raaga.com: ‘Prince’ Mahesh Babu celebrates his birthday with Rs100 Crore hit SRIMANTHUDU! ‘Prince’ Mahesh Babu celebrates his birthday with Rs100 Crore hit SRIMANTHUDU! South sensational superstar ‘Prince’ Mahesh Babu turned 40 on Sunday and what better gift he could wish than his latest movie SRIMANTHUDU breaking all box office records! 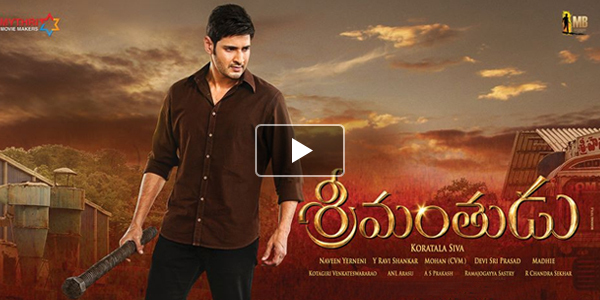 According to trade pundits SRIMANTHUDU amassed a whopping Rs 50 crore in just two days (Friday and Saturday). Looking at the unprecedented crowd, trade analysts are expecting a huge windfall and have predicted that the film would soon cross the prestigious Rs 100-crore mark. Released in around 2,500 cinema halls, SRIMANTHUDU’s craze among movie buffs was such fanatical that movie buffs packed cinema halls to watch first day first show with full gusto and fervor. To cash-on Mahesh Babu’s popularity cinema owners cleverly began the show at 4.00 am on Friday morning at many cinema houses in Andhra Pradesh, Telangana and Karnataka and surpassingly all the shows registered 100% occupancy despite the wee hour!!! According to cinema owners the film has generated such a boisterous response that many cinema houses had to increase the screen count after seeing the huge demand. SRIMANTHUDU with its Rs 13 crore + first day collection broke superstar Pawan Kalyan's ATTARINTIKI DAREDI, which had raked in Rs 10.75 crore on its opening day. Mahesh Babu’s next release is a Tamil - Telugu bilingual titled BRAHMOTSAVAM. We at Raaga.Com wish Mahesh Babu many happy returns of the day and hope he keeps entertaining and his future film rack in big business thus taking South film industry leaps and bound!